The General Staff of Ukraine’s Armed Forces reported at 12:30 PM Kyiv time that in the last 24 hours, no Ukrainian soldiers were killed and three Ukrainian soldiers were wounded in action. In the last 24 hours, Russian-terrorist forces opened fire on Ukrainian positions on the Luhansk and Donetsk sectors of the front 24 times in total. The Kharkiv Human Rights Protection Group (KHPG) reported, “Yevhen Panov has been sentenced to eight years in Russian-occupied Crimea on ‘sabotage’ charges for which there is not a scrap of evidence. The sentence, to be served in a maximum security prison, was met with cries of ‘Glory to Ukraine’ from Crimean Tatar and other Ukrainian activists who had come to show support, an act of no small courage under Russian occupation. 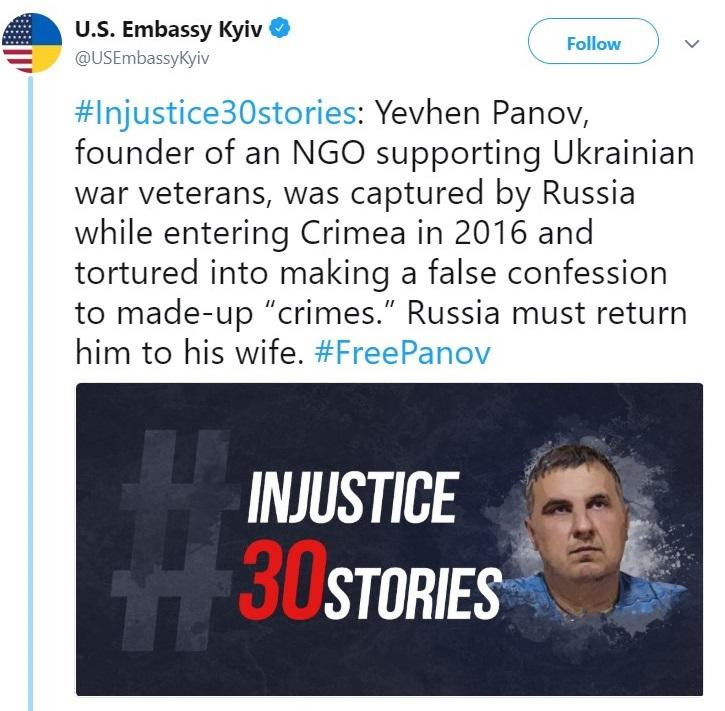 After being taken prisoner by the FSB [Russian security service] and widely showed on Russian propaganda channels ‘confessing’ to planned acts of sabotage in Russian-occupied Crimea, there was effectively no chance that Panov would be acquitted. 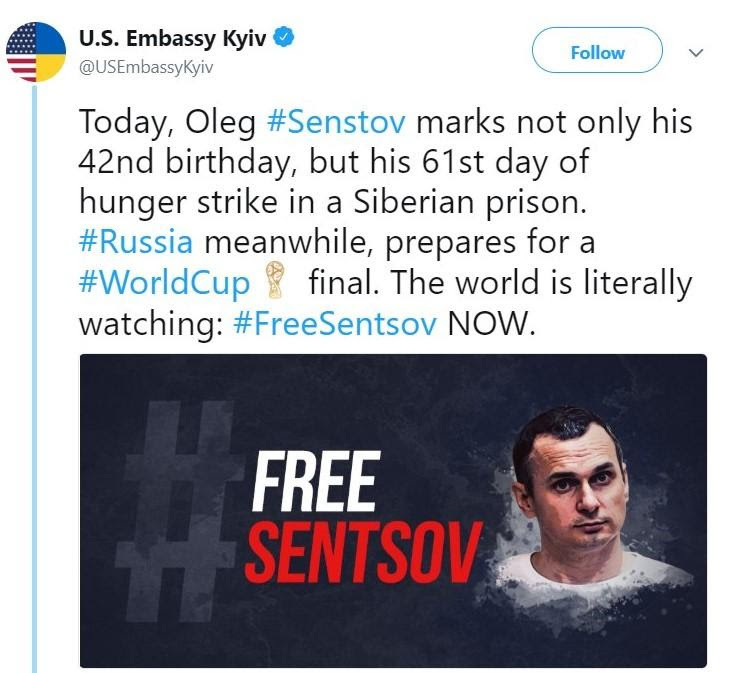 However, the fact that he received a sentence so much higher than the other three men arrested was undoubtedly because he consistently highlighted the lack of any substance and the use of torture in Russia’s attempt at a ‘Crimean saboteur plot’. Not only did Panov retract the ‘confession’ tortured out of him for Russian television, but he also maintained this refusal to collaborate in any way, despite the FSB stating quite unambiguously that this would significantly increase the sentence handed down and mean that he would be sent very far into Russia, and away from his family. Such stubborn courage was most inconvenient for the FSB since this ‘case’ was so absurd that two of the other three men arrested were convicted of changes that were very different from what they had also been shown ‘confessing’ to. On July 12, Ukraine’s Presidential Administration reported, “President Petro Poroshenko underlines the importance of the meeting with President of the United States Donald Trump before his meeting with the President of Russia. ‘This was an absolutely trustful conversation and I’m pleased that Ukraine was given priority. And it was absolutely necessary to speak to President of the United States Donald Trump before his visit to Helsinki. I am completely satisfied with this conversation,’ Petro Poroshenko said in Brussels during the press conference. At the same time, the Head of State will not disclose some of the issues discussed during this meeting. According to him, during the conversation with the President of the United States, significant attention was paid to the meeting to be held on Monday in Finland. ‘We thoroughly discussed the next meeting of President Trump to be held in Helsinki on Monday, July 16. The issues of the Nord Stream 2 were carefully discussed as well. I informed President Trump in a very detailed manner,’ the Head of State noted. He also said that during the conversation the achievements of Ukraine in advancing reforms were emphasized. In particular, the interlocutors stressed the importance of adopting a bill by the Verkhovna Rada of Ukraine, which establishes the jurisdiction of all anti-corruption cases for the new anticorruption court. Answering the question whether the issue of the annexation of Crimea was discussed with Donald Trump, Petro Poroshenko stressed that the position of all Alliance members was reflected today in a statement following the Summit. ‘It is clearly written. This is a statement approved by all members at the highest level, including with the participation of President Trump. The Crimean status is absolutely clearly emphasized, non-recognition of the illegal annexation of Crimea,’ he said. Reuters reported on July 12, “Ukraine’s parliament approved an amendment to an anti-corruption court law on Thursday in an effort to secure more funding under a $17.5 billion aid-for-reforms program from the International Monetary Fund. After months of delay, a law to create an independent court dedicated to handling graft cases was adopted in June, but the IMF wanted changes so that appeals to existing corruption cases were under the new court’s jurisdiction. The law is meant to ring-fence court decisions from political pressure or bribery in Ukraine. […] A failure to pass the amendment would have further delayed the reform as this is parliament’s last week in session before the summer recess. Radio Free Europe/Radio Liberty (RFE/RL) reported, “NATO’s deployment of additional resources to the Baltic region despite Russia’s opposition was a ‘necessary step’ based on Moscow’s ‘aggressive actions,’ the Western military alliance’s supreme commander says. U.S. General Curtis Scaparrotti, speaking to RFE/RL on the sidelines of the NATO summit in Brussels on July 12, said that ‘four battalions is not a threat to Russia,’ referring to the additional forces stationed on the alliance’s eastern flank and in Poland in recent months. ‘It’s Russia’s malign activity that concerns me,’ he said. ‘You know, they violated boundaries. They’ve reset territory for the first time since World War II by aggression. ‘They occupy countries without their permission. They are somewhat aggressive in our military domain at times. That’s the activity I would like to change,’ he added.